Boats in this class have a full cabin under the forward deck. There may be the addition of a radar arch; common but not necessarily on all boats of this class. These boats generally range in the length 24' and up. 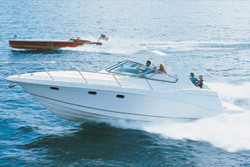 Boats that fall into this category but are less than 24' are generally thought to be class 2 boats. Some additions, along with the radar arch, are a pulpit and an extended swim platform. If there is a half tower added to this boat it becomes a class 5. 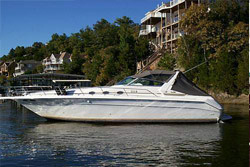 With bow rail, radar arch, extended swim platform and 2 piece cover.